I love bookstores. Also, record stores, art supply stores, just about any kind of store where creative work defines the merchandise. And, I’ve been fortunate because there are three good independent bookstores less than a half-hour from my home: one in the county seat, one in a town dominated by tourists, and one in a university town that’s also an easy drive (plus, several more that sell used books). Unfortunately, this month, we’re losing the neighborhood bookstore that’s just five minutes from home. They didn’t make it. 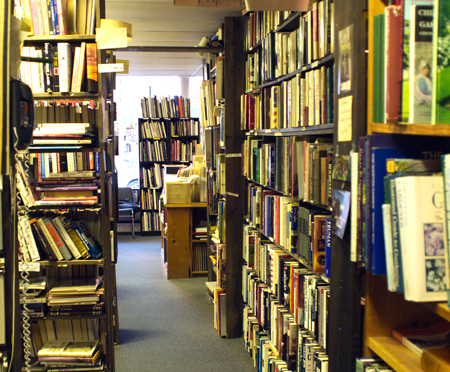 They cite e-books, internet bookstores, and the nearby Barnes & Noble (the nearby Borders closed a few years ago). The economics confuse me. Maybe you can make sense of it all. My family buys a lot of books: probably 40 or 50 books each year. We buy more books, for personal use, than anybody we know. Assume 50 books at $20 per book, and that’s $1,000 in retail business per year. I would be proud to say that we’ve bought all of them from our local independent booksellers, but I can’t say that because it’s not the truth. It would be fair to say that we’ve bought about 1/4 of those books while traveling (we especially like Toadstool Bookshop in New Hampshire, for example), and half of them online because of the convenience, price, or quick delivery. The other 1/4, we probably buy locally. One good example: a biography of the old superstar, Will Rogers, priced at $24.95 in paperback from a local bookstore, available for $16.47 from Amazon (with free shipping). We’re smart consumers–we saved $8.48 because we bought from Amazon. In a year, we make this decision maybe 20 times, so maybe we save $200 per year by buying this way. As I said, we’re smart consumers. But we’re stupid citizens. Our extra $200 per year matters to a local bookseller. If 100 customers paid the higher price instead of saving the money, that’s an additional $20,000 per year for the local bookseller. If 1,000 customers, the additional revenue nears a quarter-million dollars. So here we are, all of us, the book lovers and the book consumers, happily saving money by shopping late at night and taking advantage of super saver shipping and the deep inventory that online booksellers provide… all the while forgetting about our neighbor, the small business person, who is spending every late night trying to figure out how to keep the local bookstore’s doors open. When I think about this, I feel stupid. As I said, I really like bookstores, but just this morning, I ordered two books from Amazon, and I saved $7.33 on one of them and $15.78 on the other. This afternoon, I thought about visiting my local bookstore, the one that has been five minutes away from my house for the past few years. I feel foolish. Why didn’t I do more to keep a community institution in place?